In Suita city, Osaka Prefecture, the World Campus – Japan class had the opportunity to visit several companies that are located in this area. Below are reports from 2 of our participants. 1. The Malony Co., Ltd. I visited Malony Co., Ltd. on the March 17th. The company is known for producing the famous Malony (noodles made of corn and potato starch), which you can find in most supermarkets throughout the country. Production of these started in 1964 and they sell especially well during the wintertime, when used by most Japanese in Nabe (Japanese kind of Hot Pot). We got to talk to the general manager of the sales division of the company, got an overview of the company’s development and had the chance to ask questions. Another fascinating part was when we got to see the different stages of how noodles look like while being produced. First it looks like a thick, clear and soft sheet of gummy. This is then cut into long noodle strains of about 2.5 meters, before the noodles are cut into their original size. It’s been a fun and informative day. 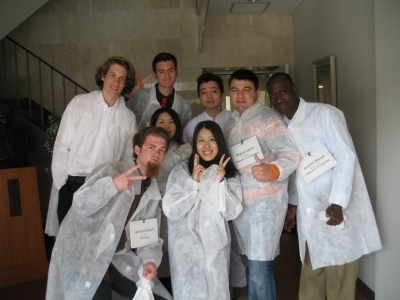 We all had to wear white protective clothes and a hat because of hygiene reasons, which made all of us look like smart chemists. I had the chance to take home a couple of long noodle strains to proudly show to others. We learned that the company does not really expand to the international market for the time being. It would be very hard to compete against the local market in a different country, since the success of a food company is especially depending on dietary needs in the region. I went to the Asahi Broadcasting Company (ABC). ABC is a local television and radio station, which primarily produces TV programs and radio for the Kansai Area for approximately 21 million people. Our tour began with a round table discussion where our initial questions were answered. We learned that Japan has 7 key stations throughout the country plus many local broadcasting companies. While visiting the master room, where the TV shows are brought on air, one could already see the change from analog to digital TV. In fact, ABC will move to a new building this year because they will be getting new equipment for this rapidly growing digital age. Another very interesting opportunity was to watch an on air radio interview, because you could see the radio moderator live in action. After the lunch at the company cafeteria, we went to see the ABC symphony hall, which was the first concert hall exclusively built for western classic music in Japan. Not only the sound quality but also the huge pipe organ was astonishing.